Tennessee Department of Transportation employees work to remove the concrete railing that fell from the Interstate 75 South ramp to I-75 South onto the I-75 North to I-24 West ramp Monday, April 1, 2019 in Chattanooga, Tennessee. The I-75 South ramp is expected to be reopened to one lane by Monday night or Tuesday morning. UPDATE: The I-75 South ramp has been reopened to one lane. The ramp will remain one lane until repairs can be made, according to a TDOT news release. The side of an Interstate 75 South bridge ramp collapsed late Monday morning, tumbling onto the I-75/I-24 ramp headed to Chattanooga, stopping traffic at one of the region's busiest intersections and injuring a driver who plowed into the fallen debris. The driver's injuries were not considered life-threatening, according to the Chattanooga Police Department, as state and local crews turned their focus to repairing and reopening the interstate system. The collapse occurred at about 11:30 a.m. and closed all lanes on I-75 North to I-24 West. The I-75 South ramp to Atlanta also was closed. TDOT's report on the I-75 south bridge that collapsed onto the I-24/I-75 split on Monday, April 1, 2019. 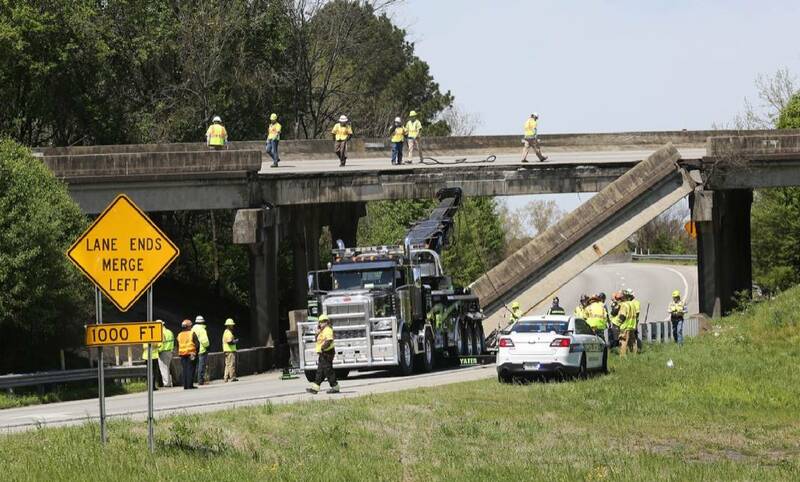 It's still not clear what caused the bridge's concrete railing to come crashing down, according to Tennessee Department of Transportation officials. However, they are confident the bridge, which was built in the 1950s, is structurally sound and its condition will not lead to further injuries. They planned to reopen the bridge late Monday night or early Tuesday morning after placing a new barrier to block traffic from the side that collapsed. They then would allow drivers to pass in the lane opposite of the collapse. The I-75/I-24 ramp below the bridge reopened Monday evening. Emergency repairs will begin soon on the collapsed section and are expected to be completed within about three to four weeks. The bridge will then be fully replaced shortly afterword during an interchange redesign planned for later this year, officials said. "It had normal problems that an older bridge would have, but there was nothing structurally wrong with it," TDOT regional bridge manager Steve Hutchings said. "There was no reason for us to suspect anything like this would happen. Everything was in good condition." The result is considered a positive report, Hutchings said, as most bridges in the area rate as fair-to-good. Since it was built, only one of the guardrails has been repaired, Hutchings said. Apart from that, "the structural bones of the bridge are the same as when it was constructed." Tempers ran high as traffic slowed to a crawl on I-75 and surrounding roads. Drivers were more prone to hit their car horns in frustration as other drivers merged, often at the last minute, into open lanes. Chattanooga Police Department Lt. Danny Jones said Monday afternoon he was not aware of any crashes as a result of heavier traffic on alternate routes. "A frightening bridge collapse at one of the most heavily trafficked intersections in the country, where 75 and 24 meet," Chattanooga Mayor Andy Berke posted to Facebook. "Truly miraculous that no one was seriously injured." TDOT spokeswoman Jennifer Flynn clarified that the bridge did not fall: "The bridge didn't collapse," she wrote in an email. "The railing fell off for some reason. Our bridge inspectors are on the scene." Officials were hoping to have the I-24/I-75 merger fully opened before Tuesday's morning rush hour, with the exception of one lane on the partially collapsed bridge. In the meantime, police were urging motorists to avoid the area. Monday afternoon, school officials warned parents that school buses might be late dropping off students as roads in and around the area were expected to be congested. The collapse is not expected to speed up the construction timeline of the already planned I-75/I-25 redesign, according to Flynn. Construction on the project is expected begin this summer and will cost an estimated $65 million. It is part of former Gov. Bill Haslam's IMPROVE Act. Most of the existing interchange roadways will be moved and straightened. The design incorporates less dramatic curves and adds bridges called "flyways" that allow more room for the interchange ramps — similar to a scaled-down example of the interchange at I-75 and Highway 153. In 2017, former Tennessee Department of Transportation Commissioner John Schroer said the interchange was "about the worst interchange in the state of Tennessee." Tennessee examined many of its bridges exactly two years ago after an Interstate 85 bridge collapsed in Atlanta in March 2017. That collapse was caused by debris under the bridge that had caught on fire. It's unclear the full extent of TDOT's examinations at that time, but the inspections focused on ensuring items weren't being stored under bridges. This story was last updated Monday, April 1, 2019, at 9:52 p.m. with information about the ramp being reopened to one lane.